A 560hp Detroit DD15 engine powers BJR's Freightliner Argosy. Not only does he have muscles on top of muscles but Paul ‘Stax’ Eddy really, really likes his Argosy. BJR's 45 employees and 10 contractors diligently work to keep the V8 Supercars in race worthy condition. Stax cites room inside the cab and cab access as big plusses for the Argosy. The Argosy has been covered in giant vinyl wraps for the 2016 V8 Supercar season. Owner//Driver goes behind the scenes at Brad Jones Racing. In the past I’ve had a somewhat troubled relationship with Freightliner’s cab-over contender. But to be fair it’s been a while since I’ve actually climbed behind the wheel of a Freightliner Argosy. So the guys at Freightliner must have been pretty happy that my first drive of the Argosy in years would be with a tattooed, shaven headed guy who’s built like a brick sh**house. Not only does he have muscles on top of muscles but Paul ‘Stax’ Eddy really, really likes his Argosy. And within minutes of meeting him I figured that in the interests of self-preservation it may not be very smart to argue with him about it. Now that’s one persuasive brand ambassador. It turns out that Stax is actually a really nice bloke, who for many a petrol head has a dream job. 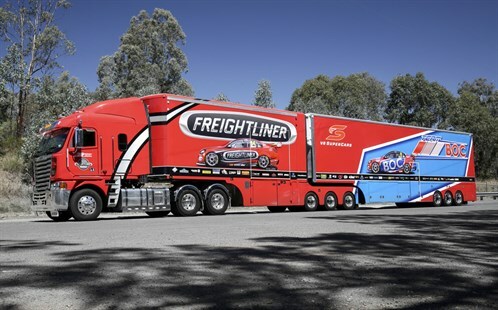 Stax drives the transporter for New South Wales-based V8 Supercar outfit Brad Jones Racing (BJR). After all, how many driving jobs do you know that only require you to cover about 40,000km a year? The rest of the time Stax looks after the team’s tyres, and on race day he also gets to man the jack on pit lane. A 560hp Detroit DD15 engine powers Brad Jones Racing's Freightliner Argosy. We turned up to have a look around behind the scenes of BJR recently. 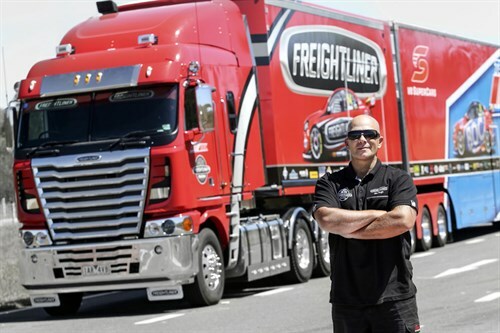 The modest group of three factory units tucked away in an industrial back street on the Victoria-NSW border is home to the Freightliner Racing team, BOC Racing as well as Team CoolDrive. While the surroundings may look humble, inside the brick unit 45 employees and 10 contractors diligently work to keep a total of seven cars in race worthy condition. Brad Jones took the time to show us around his facility, which also houses three CNC machines to turn out the various bits and bobs to build a V8 Supercar. The V8s use a control chassis that BJR acquires as a kit and assemble on site. We got to see the embryonic skeleton of a build in progress while wandering around the workshop. The affable Jones is justifiably proud of the team’s ability to quickly manufacture components when needed. "We need to be self-sufficient," he says. "I’ve come a long way from working under a car port at (brother) Kim’s house with four jack stands." Not only does he have muscles on top of muscles but ‘Stax’ really likes his Argosy. On the day of our visit the place was a hive of activity as the team prepared for some testing at Winton Raceway, just down the Hume Highway from Albury. After having a good look around I got the chance to jump behind the wheel of the Freightliner Racing Argosy for a quick spin down the road. Stax must be a pretty persuasive fella because his Argosy is equipped with the 110-inch sleeper cab and king single bed, so there’s plenty of room to move inside. That said, while Stax is on the move he only uses the bunk about 50 per cent of the time. The rest of the time he opts for the convenience of a motel room. I scaled the Freightliner’s famed swing-out step and slid behind the wheel of Stax’s gleaming red steed. The B-double transporter set behind us was empty, but Stax reckons that with everything on board the Argosy tips the scales at 58 tonne gross. The biggest challenge for Stax is juggling the weight to get more on the middle triaxle group as the combination tends to throw weight more onto the rear axle group. 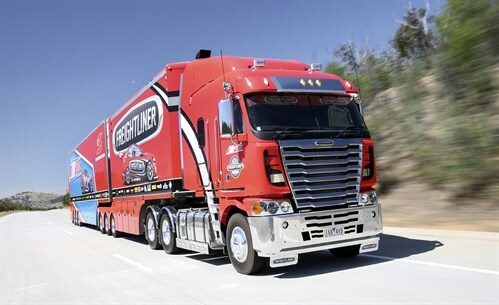 The Freightliner Argosy received new graphics for the 2016 V8 Supercar season. I took the red Argosy for a spin up the Hume to the Blue Metal parking bay near the now bypassed village of Woomargama. The DD15 under the cab hauled along nicely as we hit the highway. The somewhat notchy gear shift of the Argosy takes a little while to settle back into after spending time as I have been lately driving bonneted prime movers. While my personal preference is for the manual version of Eaton’s 18-speed ‘box, the short throw of the Argosy’s gear stick requires you to be on the ball when grabbing a cog. Stax used to drive for a local linehaul company and still clocks up a mile or two for them during the off season. He has a real preference for the Argosy though and cites room inside the cab and cab access as big plusses. Having clocked up quite a few kilometres in Argosys over the years myself, I can only agree with his observations. I’d probably add the cab-over’s turning circle as a big plus as well, especially when it comes to poking a couple of trailers into a tight spot in reverse. Before we could debate the Argosy’s attributes much further it was time for me to climb out and make way for another driver.